Description: Let's party up! Meet all your needs in Angels' Party. Click the icon of Angels' Party you will see four parts. They are Angel Spirit, World Boss, Angel Chest, and Angel Shop. 1. 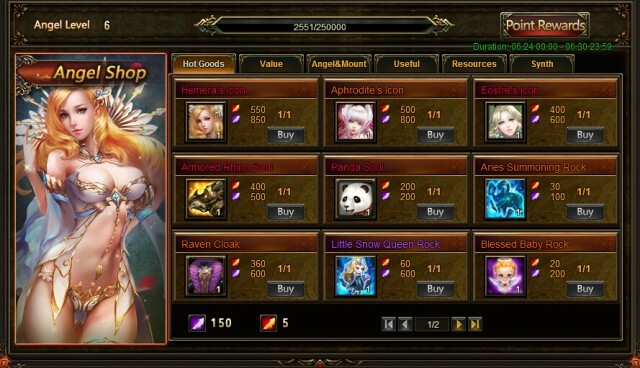 Angels' Party consists of 4 parts: Angel Spirit, World Boss, Angel Chest and Angel Shop. 2. Every White Feather acquired will earn a player 1 personal point and increase the Angel Spirit's EXP by 1. Every Gold Feather acquired will earn a player 2 personal points and increase the Angel Spirit's EXP by 2. 4. Join the World Boss during the event for a chance to receive White Feather. The top 50 in World Boss ranking have a chance to receive White Feather and Gold Feather! Resources, White Feather, Gold Feather, Vitamin are waiting for you in Gift Boxes! You can randomly get one of the following items with different kind of keys. There are 3 kinds of gift boxes. You need to collect keys to open them. 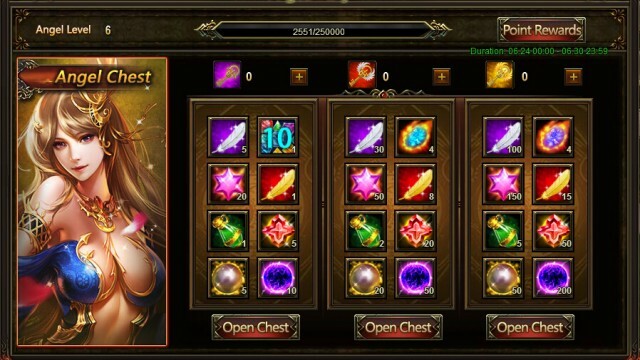 You can get Normal Gift Box Key, Angelic Gift Box Key, Divine Gift Box Key through hot events or use diamonds to buy. You may ask, how to deal with the Feathers I have got? Ok, here comes a chance for you to exchange items with Feathers! 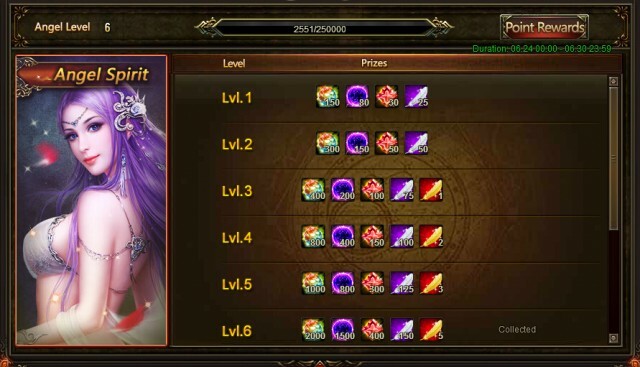 Here you can get mount Armored Rhino, Panda, Phoenix, Jade Dragon, angel Hemera, Aphrodite, Eostre, Elena, Fairy Blessed Baby, Little Snow Queen, Clothing Raven Cloak, Elvish Spring, and many more other items! Description: Complete daily challenges to collect Gold Feather! Description: Complete daily challenges to collect White Feather! Description: Collect enough keys to open more chests! Description: Recharge certain amount of diamonds to get items for Angels' Party! Description: Log in everyday to collect Keys and Darics! More exciting events are coming up through Jun 24 to Jun 30 (server time), check them out in the in-game Hot Events menu!